The 5S method is a visual system that organizes workspaces more logically and removes unnecessary items in order to standardize processes and enable employees to work more efficiently. This system originated in the 1950s, as the Toyota Motor Company was developing a new system for manufacturing, known as the Toyota Production System (TPS) or Just-in-time (JIT) manufacturing. One key element of Toyota’s approach was to organize the workplace floor so that needed items were convenient to use, quick to find, and easy to put away; the five-step method for accomplishing this became known as 5S, or lean production. When companies around the world began turning to lean production in the 1990s, 5S became one its most popular production tools, due in part to its simplicity. Sort seiri (整理): Inventorying all items in a location and removing all unnecessary ones. Set in Order seiton (整頓): Putting all necessary items in the optimal place for fulfilling their function in the workplace. Shine seisō (清掃): Cleaning and inspecting the workplace, tools and machinery on a regular basis. Standardization seiketsu (清潔): Ensuring uniformity in all the processes used to sort, order and clean the workplace. Sustain shitsuke (躾): Enabling workers to develop good habits so they can maintain these processes without being told to do so by their supervisors. Jovani received extensive 5S training after graduating from the University of Texas at Arlington with B.S. in Management. He worked at Texas Instruments (TI) for three years as a sub-contractor for cleaning services at a semi-conductor manufacturing facility, including Class 1-3 clean rooms. The 5S training he received while working at TI enabled him to efficiently maintain two fabs with 98% clean rating that were regularly audited by Toyota and Bosch. When Jovani joined Flagship in 2014, he was eager to utilize the same 5S principles to bring order to such a large and potentially chaotic location, with large teams of front-line employees working on three shifts, 24 hours a day. One of the biggest problems Flagship had at DFW was a large accumulation of garbage on the ramps, including luggage tags, trash collected from airplanes, and lunch containers left behind by American Airlines employees. Miscellaneous trash cans of different sizes were scattered around the ramp area, and if people couldn’t find a trashcan, they left their garbage on the ground. One of the key tenets of the 5S system is that every item should have a purpose, and if it does not have a purpose, it must be removed. Jovani asked Rubbermaid to assess the situation, and they recommended that the current 15-20-gallon cans be replaced with identical 45-50-gallon cans, with attached lids to ensure neatness and minimize odors. 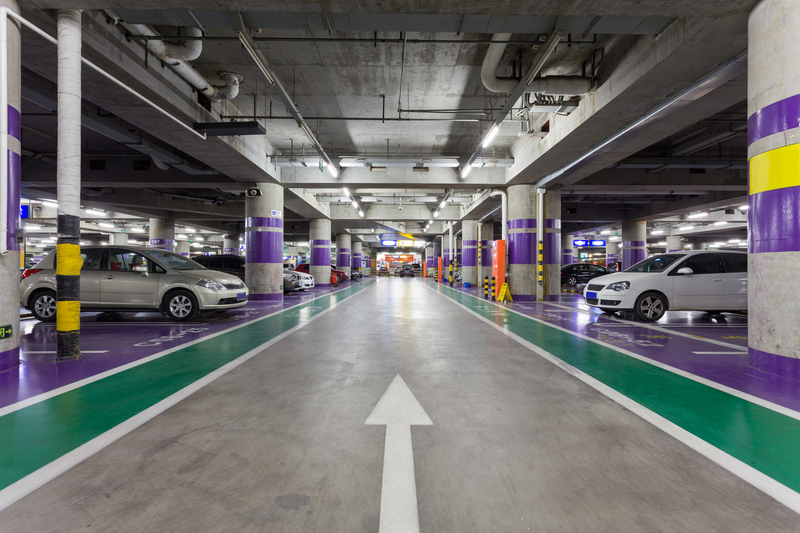 The proper location of each can is stenciled on the can itself and indicated through markings on the floor, so that front-line employees can easily empty them and return them to the proper location. 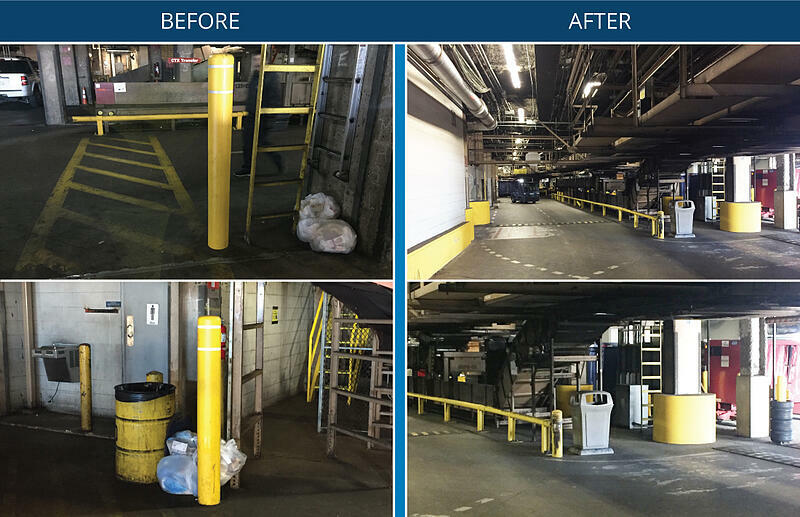 Now Flagship’s front-line employees understand where the trash cans belong, and supervisors reinforce these lessons by walking through the ramp areas all day, making sure that everything is in its designated spot. This has resulted in neater ramps and labor efficiencies, since Flagship’s front-line staff only need to empty the larger cans every 12 hours. Reorganizing janitorial closets, designating where every item belongs in order to simplify the process of grabbing needed supplies quickly. The plan is to redo one closet as a pilot project, then implement the same system throughout the facility. Standardizing the location of wall-mounted chemical dispensers throughout the facility in order to maximize efficiency. Efficiency: Logical visual organization makes cleaning tools, supplies and equipment more easily accessible; the time saved can be applied to cleaning tasks. Safety: A clean and orderly work area eliminates slip and fall and tripping hazards for both front-line staff and facility users. Less Space Required: 5S eliminates unneeded tools and equipment so that precious storage space can be used more efficiently. Standardization: 5S is a visual system that makes it easier for all team members to spot non-standard conditions and quickly correct them. Long-Term Cost Efficiency: When properly implemented, 5S can extend the lifecycle of cleaning equipment, controlling the cost of cleaning and potentially resulting in better indoor air quality.